I took the photo last week in Sam Moon, a supermarket-sized emporium of fashion accessories. 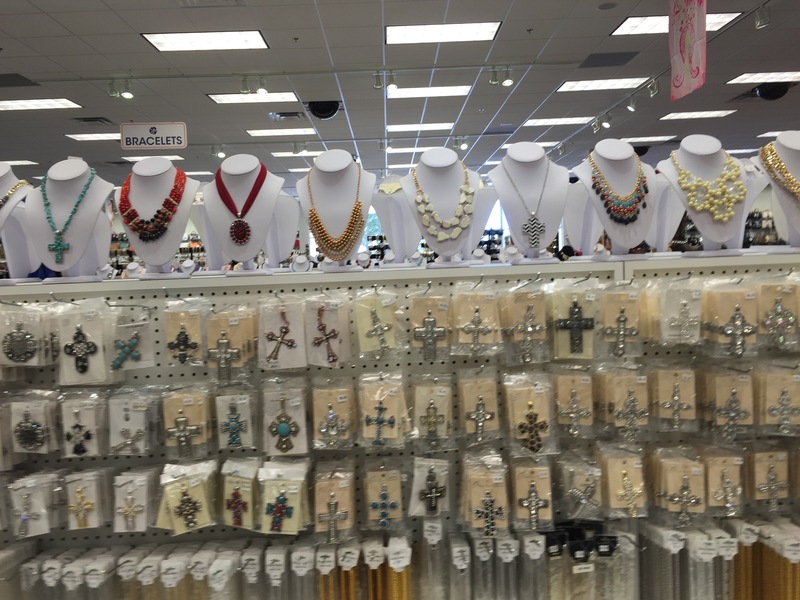 I wasn’t surprised the store carried crosses, but I was overwhelmed by the row of big, honking sparklers. Madonna should be so proud. The pop icon, not the Virgin. When the singer released “Like a Prayer” in 1989, she lost a lucrative advertising deal. Pole dancing with religious iconography was too controversial for the makers of Pepsi Cola. Today, an entire aisle of emblems in a store that caters to tweens and teens says more about style than theology. What changed? In the 70s, I wore shoes printed like the American flag. I, too, had my haters. I had to leave my red-fringed, star-on-the-toe moccasins at the door outside my girlfriend’s house. Her dad said they were unpatriotic. I was fourteen. I wasn’t making a statement. I just thought they were cool. I wonder how he’d feel now about co-opting the American flag for a lapel pin? Are pins patriotic? Shoes, not so much? For that matter, why is a dainty gold cross an acceptable baptismal gift, when the same symbol on a rock star wasn’t wholesome enough to sell soda? Is it a matter of degree? Early Christians rejected the cross altogether because they associated it with a gruesome way to die. It’s a good thing to use art to question authority, but what happens when a controversial idea goes mainstream? Is there a statute of limitations on behavior calculated to shock? I found “Like a Prayer” on YouTube. Madonna’s writhing seems tame, now. And maybe a little embarrassing. Try watching it without the sound.